This forms part of a larger project of compositional research that treats instruments as resonant spaces, using different forces to activate and sculpt the natural resonant frequencies of that space and an exploration of its harmony. See also the collection of pieces called There are neither wholes nor parts. Jan 2015: I was asked to write a piece for LSTwo, the student contemorary music ensemble at University of Leeds. The euphonium was to be a particular focus of this piece, and through working with the player I set upon the idea of using the euphonium to excite a set of suspended percussion. In the first few tests, we attached contact-microphones (to pick up only the vibrations of the objects, not the the air-vibration of the euphonium) to various items; cymbals, timpani, gongs, piano strings, sheet metal. Microphones were generally positioned on or near the bell, depending on size of instrument: this favoured higher partials, and avoided damping the cymbal too much (though it would be interesting to place microphones at specific nodes along the cymbal edge to dampen selectively). All of these had some interesting responses; the timpani especially tended to produce the 5th partial especially strongly. For the piece itself I decided to use seven cymbals and a tam-tam: eight inputs because that was easy to integrate into the mixer system for this concert. The tam-tam was included because it responded to any pitch, and was useful was a base layer of plate-reverb. In perormance, the cymbals were isolated from the players due to feedback issues; the euphonium signal was projected at the cymbals from two large genelec speakers, slightly louder than an acoustic euphonium. The cymbal sound was fed back into the hall. The cymbals used remain the same for the entire project; to use different cymbals would require a complete rewrite of the score, because the resonant pitches would change. See below for impulse responses of my cymbals, and examples of each cymbal's response to various input pitches. Initially, I thought of this piece as an acoustic version of Resonant Systems, where a sinewave is used to trigger multiphonic sounds in the cymbal by exciting two related vibrational modes simultaneously. I had hoped that in this piece the excited cymbals would produce pitches unrelated to the harmonic series of the input euphonium pitch, but this was not the result. The cymbal response to euhonium excitation is usually one or more partials of the input pitch, depending on resonant matches between harmonic series of the euphonium note and a vibrational mode of the specific cymbal. Presumably there is just not enough energy in the euphonium to excite more complex response. Later tests involved the euphonium playing slow chromatic scales at each cymbal to test its response. 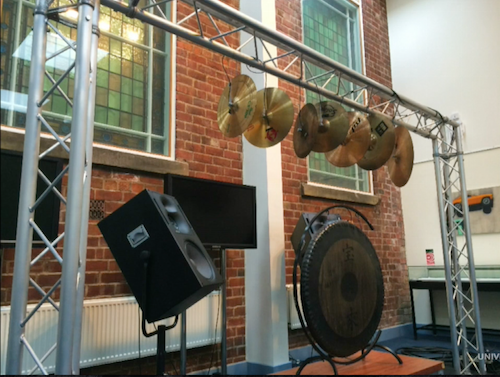 Impulse responses of the cymbals were also taken but these did not prove useful in finding resonant pitches: I don't yet know why... The score was written from analysis of the cymbal responses. Particularly strong responses were tabulated, common pitches found, and used to create a network of connections between the cymbals that gave the piece a structure of varying harmonic centres: due to the prevalence of low-order partials of harmonic series', the piece has a generally triadic character, with some interesting 'chord progressions' in places where comon pitches between mediant-related triads could be found. The other instruments in the ensemble (fl, cl, a.sax) became a chorus, sustaining and blurring the cymbal resonances. In performance, there was a slow-building layer of gentle feedback that was an unexpected but useful addition: the cymbal channels were mixed live in the space. Special thanks to Alex Harker for his impulse-reponse capture patch (MaxMSP) currently being developed as part of the excellent HISStools package. Each of these examples is taken from the live performance, where all eight cymbal channels were separately recorded. Each of these examples is a sequence of cymbal responses to the same euphonium note (concert pitch): cymbals 1-7, tam-tam 8. In the piece itself, all eight cymbals sound together (selectively mixed). The different responses to the same A2 are interesting, presumably the result of variances in dynamic and shaping, but also dependent on the resonances activated by previous notes. The impulse responses recorded for the cymbals can be found here (11mb zip). Note that there are eight cymbals in the zip, the second of these was not used in the piece, so the cymbals numbered 1-7 in the piece map onto IRs 1 and 3-8.